A close-up of one of the numerous LED panels which make up the screen on the outside of Goodyear's Spirit of Innovation blimp, tail number N2A. Suspended on the outside of the blimp, the screen enables information and advertisements to be viewed by spectators at events the blimp is covering. Local Louisville, Kentucky private pilot Matt enjoys a tour of the cockpit of Goodyear's Spirit of Innovation blimp, tail number N2A. 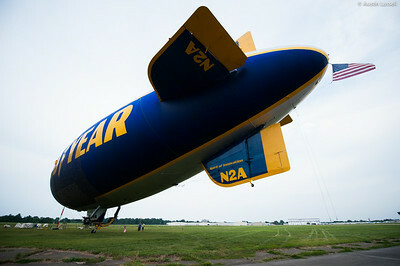 The Spirit of Innovation is one of three blimps currently operated by Goodyear to cover events across the United States. In this photo the blimp was in Louisville, Kentucky in order to provide coverage of the 2014 PGA Championships at the Valhalla Golf Club in Louisville, Kentucky. Goodyear's Spirit of Innovation blimp, tail number N2A. In this photo the blimp was in Louisville, Kentucky in order to provide coverage of the 2014 PGA Championships at the Valhalla Golf Club in Louisville, Kentucky. A view of some of the numerous LED panels which make up the screen on the outside of Goodyear's Spirit of Innovation blimp, tail number N2A. Suspended on the outside of the blimp, the screen enables information and advertisements viewed by spectators at events the blimp is covering. 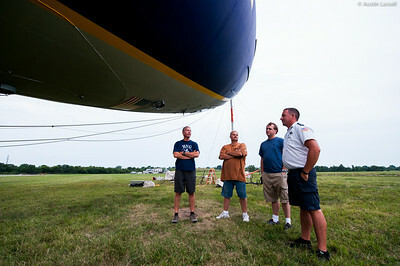 Local Louisville, Kentucky pilot Mark speaks with a mechanic overlooking Goodyear's Spirit of Innovation blimp, tail number N2A. 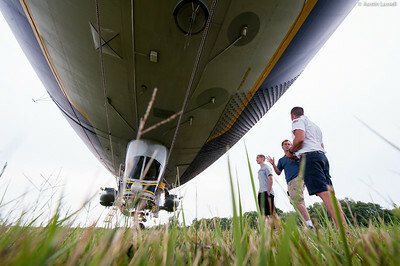 As the blimp is not designed to truly land, it can be damaged should it rest its full weight on the ground. As such ground support crew members are provided around the clock, 24/7, to ensure that the blimp is in proper operating order. In this photo the blimp was in Louisville, Kentucky in order to provide coverage of the 2014 PGA Championships at the Valhalla Golf Club in Louisville, Kentucky. A close-up of one of the two 210 horse power engines that provide propulsion for Goodyear's Spirit of Innovation blimp, tail number N2A. Despite the great size of the blimp, it utilizes a fairly simple system of propulsion with a combined horsepower that is less than that of many high powered boats. The blimp is also not one of the fastest aircraft in the sky, cruising at a some 40 miles per hour. However, it's slow speed is easily made up for given that the blimp is able to remain aloft essentially effortlessly as compared to other types of aircraft, making it well suited for covering lengthy sporting events. The Goodyear blimp is no small feat. At 50 feet in diameter and 192 feet in length, Goodyear's Spirit of Innovation blimp, tail number N2A, houses some 200,000 cubic feet of helium, making the blimp itself a repository of a small fortune of the natural resource. Although the blimp weighs over 10,000 pounds empty, the addition of the lighter than air helium reduces the blimp to weighing only a few hundred pounds. In order to raise and lower the blimp, large rubber bladders of air are inflated or deflated inside the blimp. 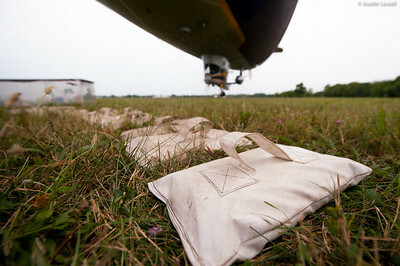 This action changes the density of the blimp relative to the surrounding air, making the blimp more or less buoyant. 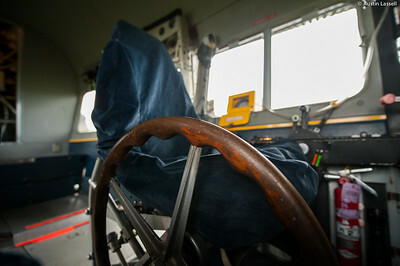 A close-up of the control wheel adjacent to the captain's seat of Goodyear's Spirit of Innovation blimp, tail number N2A. 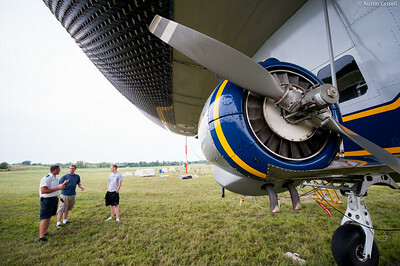 Unlike other aircraft that may use a yoke to pitch the aircraft up or down, the Goodyear blimp uses the wheel seen here to do so. The blimp acts much like a boat as compared to other aircraft, using buoyancy rather that the Bernoulli effect to remain aloft. 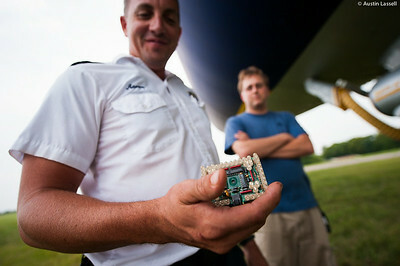 This poses both a number of challenges and advantages for a blimp. Although environmental factors such as sunlight and rain effect blimps more strongly than other aircraft, a blimp is able to remain aloft essentially effortlessly as compared to other aircraft. 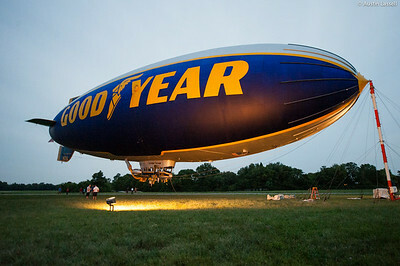 This makes blimps, such as the Goodyear blimp, safe stable floating platforms ideal for mounting cameras to cover sporting events or lighted signs. 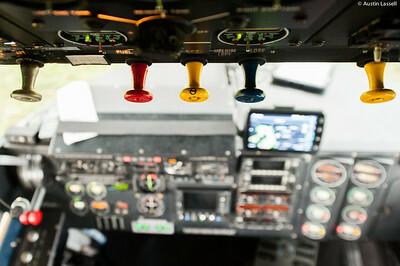 A close-up of a control panel in Goodyear's Spirit of Innovation blimp, tail number N2A. In this photo the blimp was in Louisville, Kentucky in order to provide coverage of the 2014 PGA Championships at the Valhalla Golf Club in Louisville, Kentucky. 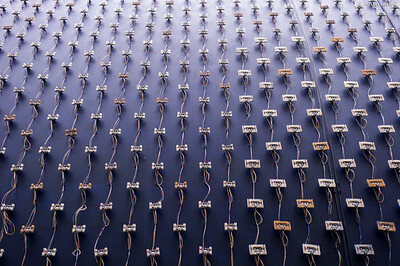 A close-up of numerous 25 pounds ballast weights used to help maintain the balanced flight of Goodyear's Spirit of Innovation blimp, tail number N2A. During flight, in order to raise and lower the blimp, large rubber bladders of air are inflated or deflated inside the blimp to make the blimp more or less buoyant by changing the density of the blimp relative to the surrounding air. The purpose of the solid ballast weights is to compensate in the case that this inflight system is not adequate to maintain proper buoyancy. It is important to note that the solid ballasts are not removed during flight, only added or removed before a flight. 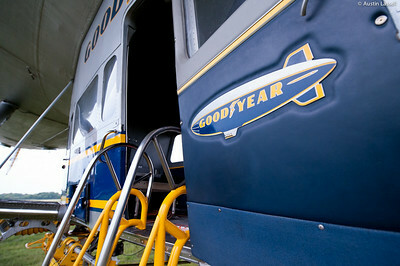 The Goodyear Spirit of Innovation blimp, tail number N2A, was built in 1983 by Lockheed Martin. The Spirit of Innovation does not have an internal structure like a zeppelin to maintain its shape, but rather uses the pressure of the helium inside it to hold out the sides of the blimp. What holds the helium is a large rubber bladder known as an envelope. Since the envelope has to remain pressurized it can wear over time and must be replaced every 10-14 years. In order to monitor the condition of the envelope, the Spirit of Innovation features a clear plastic dome in the bottom of the envelope that allows pilots or mechanics to quickly check for leaks. Local Louisville, Kentucky pilots speak with a mechanic overlooking the Spirit of Innovation N2A Goodyear blimp in town for the 2014 PGA Championships. 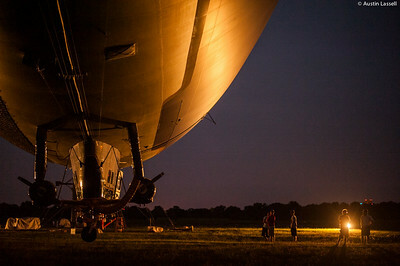 Since the balloon needs to be in perfect balance around the clock, mechanics are posted 24/7 to watch over the blimp. 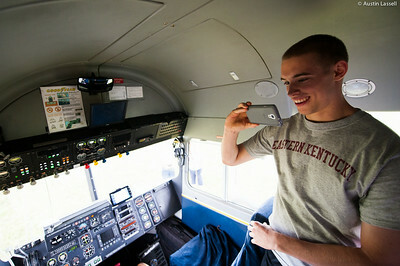 As such, a good conversation with friendly, enthusiastic fellow aviators can help to pass the time. 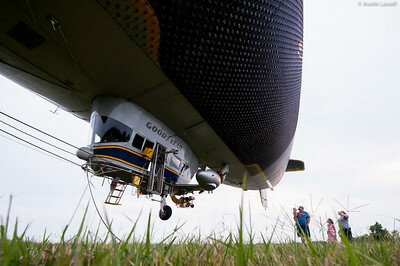 A close-up of the lower vertical control surface of Goodyear's Spirit of Innovation blimp. 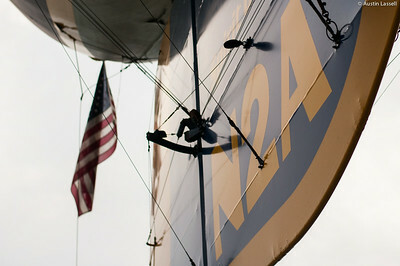 The lettering seen prominently is the blimp's identification number, or tail number, N2A. This number is required by all operating aircraft, but what makes this one unique is that this one is a surprisingly low number as compared to most other aircraft. The reason for this is that once the tail numbers are registered they are kept, and since the Goodyear blimp has operated continuously since the early 1900s, it has continued to operate under low valued tail numbers such as this one ever since. The Spirit of Innovation Goodyear blimp shortly after sunset. The Goodyear blimp has become more than simply a means for advertisement and televising, but an American symbol. Although there have been numerous Goodyear blimps over the years, indeed with three currently in operation, the image of the blimp is more than familiar to millions of Americans both attending events that the blimps cover and those seeing the blimp fly over their homes. With a slower cruise speed than many local streets, soft hum and large birthday balloon like appearance, the blimps can be a gentle reminder to relax for a minute and watch the clouds go by as calm as a blimp on a sunny day. The silhouette of the Spirit of Innovation Goodyear blimp at night. The Goodyear blimp has become more than simply a means for advertisement and televising, but an American symbol. Although there have been numerous Goodyear blimps over the years, indeed with three currently in operation, the image of the blimp is more than familiar to millions of Americans both attending events that the blimps cover and those seeing the blimp fly over their homes. With a slower cruise speed than many local streets, soft hum and large birthday balloon like appearance, the blimps can be a gentle reminder to relax for a minute and watch the clouds go by as calm as a blimp on a sunny day.